It’s always sad to see dead animals in the wild, but the death of this 16-year-old male polar bear found dead on a beach north of Norway is especially tragic. After examining the bear’s emaciated body, researchers determined that the bear starved to death due global warming. 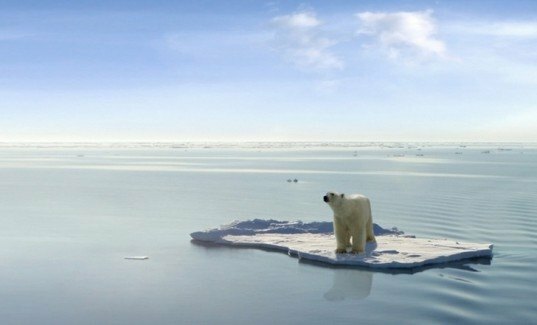 Record high temperatures have melted arctic ice sheets that this and other polar bears need for hunting. Making matters even more tragic, this same malnourished polar bear was in good health when researchers examined it just three months prior in southern Svalbard. Dr. Stirling attributed this tragedy to climate change, citing that the sea ice in the Arctic dropped to record-setting lows in 2012. Satellite images from last year show that a rapid summer melt reduced the surface of the frozen sea to less than 1.32 million square miles, which combines to be a land mass just over twice the size of Alaska. Climate change is particularly affecting polar bears because ice sheets are instrumental in their hunt for seals. Although they have webbed paws that make them incredibly good swimmers, they are still land animals and need the arctic ice to rest and haul up their catch. Ultimately the lack of ice packs will force more polar bears to migrate in search for food—as was the case with this bear, who moved from the southern to northern coast of Svalbard—hopefully to better success than this one. What a bunch of nonsense. Polar bear populations is well known to be 3 times as large as 40 years ago. All animals must adapt to new changes which are natural. That includes humans. Bears die people. Get over it! http://www.polarbearsinternational.org/about-polar-bears/what-scientists-say/are-polar-bear-populations-booming Please read the facts. polar bears are in trouble. I guess I take issue with this since they have proven that we have more ice mass now then in 2012. I would argue that it is over fishing and hunting that has cause the bears to starve. People have killed to many seals and have over fish the waters to feed an ever growing population of humans and have left our poor animal population desimated. I went to a seminar about Climate change and polar bears in the Churchill area. Polar bears numbers are factually increasing. Polar bears eat other foods. Polar bears are having a decreased chance of eating the seals because they need the ice. Other types of seals are coming in to were Polar bears feed ( a possible benefit to Polar bears ). Change happens and change is unavoidable. Not enough past history on that particular Polar bear to blame the death on starvation due to global warming. Other stressors were probably factors of its death. Again Polar bear numbers are increasing... fact. I was dr Stirling when he found the bear, he did not say it was due to global warming, he went to great pains to point out that you can not attribute the death of any one animal to gloabal warming, or any other large scale cause. All you can say is, that climate change is just one more stress on thwe chances of survival of polar populations in general, don't extrapolate away from the facts journo's!!! Question: Was an autopsy performed to determine the cause of death of this once healthy polar bear? Answer: To be sure, if there was an autopsy, the article would have jumped at the opportunity to state the results. Conclusion: Once again "expert" science is based not on facts, but on a meaningless anecdote. I think the people in Norway should start giving food to the Pola Bears like how people feeding stray cats in Singapore but of course with extra care that they don't ended up as Pola's food. Before all the Pola Bears extinct or start attacking people for food. 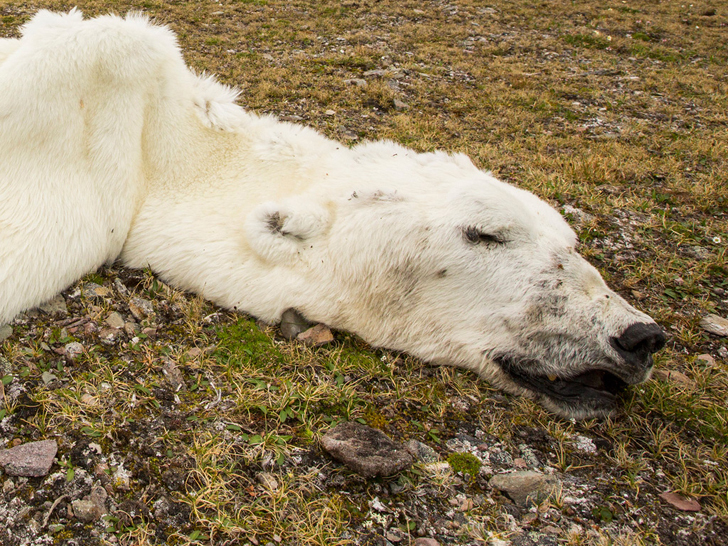 It's always sad to see dead animals in the wild, but the death of this 16-year-old male polar bear found dead on a beach north of Norway is especially tragic. After examining the bear's emaciated body, researchers determined that the bear starved to death due global warming. Record high temperatures have melted arctic ice sheets that this and other polar bears need for hunting. Making matters even more tragic, this same malnourished polar bear was in good health when researchers examined it just three months prior in southern Svalbard.